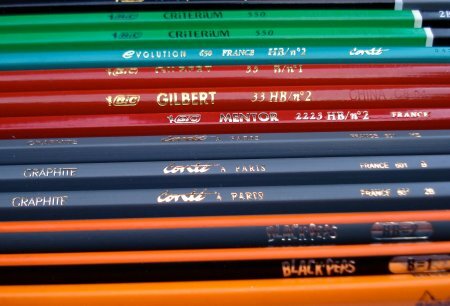 The last two weeks, we’ve looked at a few pencils from France. Or to be more precise, pencils from French companies. 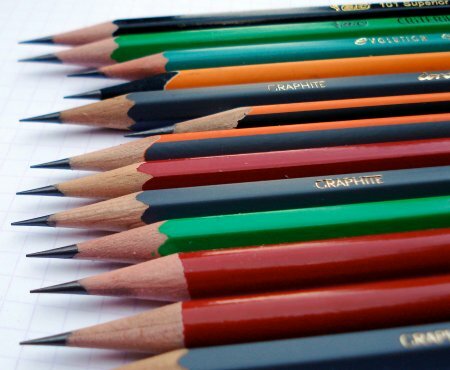 The Evolution Triangle pencil is not included, being an oversize specialty pencil. A Rhodia pad (a No. 38 in particular) seemed to be an appropriate test paper. I coudn’t find a French made eraser, so testing was done with a Spanish manufactured Factis. Overall, it is clear that these pencils didn’t come from a North American office supply store – not a bland yellow pencil in the bunch! 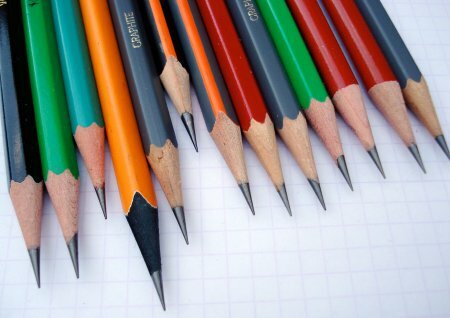 Each single pencil (except the Mentor) has an unusual colour or design. I like all of them, but the Black’Peps and Critérium 550 are the standouts for me. I tried sharpening each pencil in a Carl Decade DE-100 sharpener. Even the plastic Evolution. All sharpened well, but I noticed that the triangular pencils weren’t necessarily gripped properly. Laying down a line, I tried each pencil I had in grades HB through 2B. The Evolution, though perhaps having other merits, remained a weak performer in my view. The Mentor as well seemed scatchy. The nicest lines were from the Critérium, Black’Peps, and especially the Graphite 601. Handwriting erasure was a surprise – there were distinct differences. 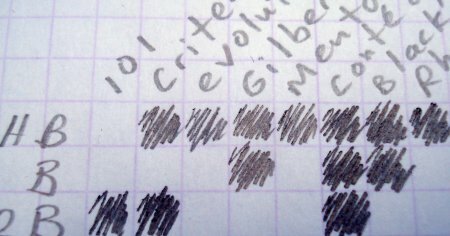 The Factis eraser on Rhodia paper cleanly erased the Critérium, Gilbert, and Graphite 601 writing – and had problems with all others. I suppose the specific formulations made the difference. 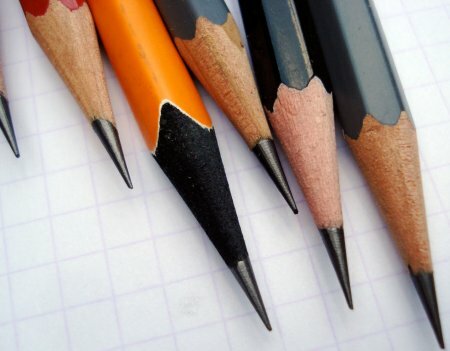 A number of these pencils have distinct merits – the Gilbert as a quality round pencil made in several degrees – the Black’Peps for innovative design in a triangular shape, the 101 for value – but I had no trouble in deciding that the Conté à Paris Graphite 601 was the best in overall quality. Nice to see all the French pencils available in Canada. Other than the Rhodia, they do not seem to have a presence in the USA. 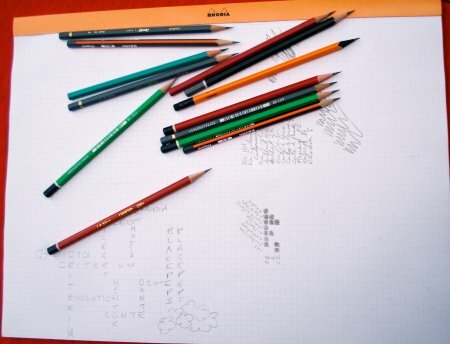 Not quite – the Rhodia and Conté à Paris are available locally, but the original articles mention that the Maped and most of the woodcase Bic pencils came from either Frank or Gunther (in Germany), and the plastic Conté and Bic 101 pencils were mail ordered from the UK and Malaysia respectively. That’s two out of eight that can be found in Canada. Just spotted some Conte graphite pencils at a local Michael’s. So the availability of two out of the eight pencil choices also holds true for the USA. I just dug up some Black’Peps at a large department store here in Taiwan, but I’ve not seen any of the other brands. Too bad, since I wanted to give that Conte 601 a try to see if it would fit in with my other pencils. I feel a little dirty being so slanted towards Japanese pencils, but it’s not always easy to find alternatives that are up to snuff. The Black’Peps, while not bad, I think may be passed off to students for note-taking exercises. I guess it doesn’t help that I’ve got a Hi-Uni B behind my ear and a 2mm leadholder with Uni lead in my pocket for immediate comparison. Having lived in Belgium for a few years, I’ve had quite a lot of experience concerning french-made pencils- I would agree that the conte a paris pencils are probably the best quality, but considering the speed i get through pencils, i found that they weren’t always readily available (though perhaps this is because i lived in belgium, not france itself). even now that i’m living in england, i stock up bic gilbert pencils when abroad because they’re so good to write and draw with and you can buy them just about anywhere. my one complaint would be that they dont have a rubber on top… i don’t find evolution a very good pencil- normally they’re the own brand type option in supermarkets and i always ind they’re hard to erase and leave a nasty sticky feeling on the page. just to say i love your blog- if someone had told me before i would enjoy reading a blog about writing implements this much before, i wouldn’t have believed them- thanks! Hi M-C, thanks very much for your comment, which turned out to be the 2500th on the blog. 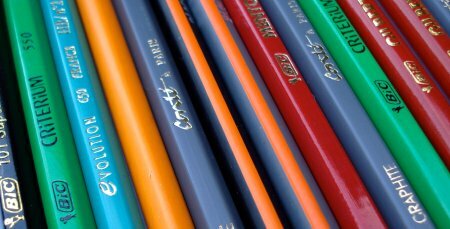 I would also buy Gilbert pencils if I could find them locally. Thank you for the french evaluation. I have been seeking the conte a paris graphite pencil for some 30 years, having first purchased them in 1978 in california. They at that time had painted tips that indicated the hardness of the leads: green=HB etc.. Are these pencils still being made? The French seem not to care about selling them here. Please help as I find the wood and leads superior and have been saving mine as a museum relic for many years. Interesting, I knew France got a lot of nice Bic items but I never knew they made wooden pencils. Does anyone know where I can get the BIC Evolution pencils in New Zealand? Just finished a pack of them that I’ve had for years, and now I can’t seem to find any more.